The Motorola M930 Bag Phone is a powerful communications tool for workers who need to stay connected in the most remote locations. 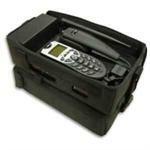 This unlock bag phone works with 800 MHz, 1800MHz or 900 MHz, 1900 MHz frequencies. US Model work on 800/1900 MHz and Europe, Africa and Asia works on GSM 800/1800 MHz. This powerful unit is a fully integrated carry-case solution featuring a built-in, durable hands-free M930 mobile phone for dedicated and convenient communication – wherever you are, whenever you need! The M930 Bag Phone GSM Unlock is designed for workers in the oil, gas, agriculture, forestry and construction industries. 1 year warranty from Motorola Israel Distributor in USA.